P'Kolino is here to help. Dedicated to improving playtime at home, the Florida-based brand offers elegant options for parents who demand quality and great design. Our favorite part though? 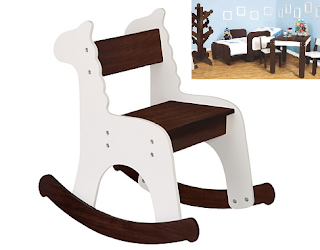 The chic Cafe Con Leche collection allows you to completely furnish your child's bedroom for under $500. How's that for economical? An animal silhouette for a playful yet sophisticated design, stable and stylish, café wood finish with milky white highlights. Create a play space where creativity can run wild! Made of quality woodand coated with a wood veneer. Product dimensions: length 22", height 22.75", width 13.5"